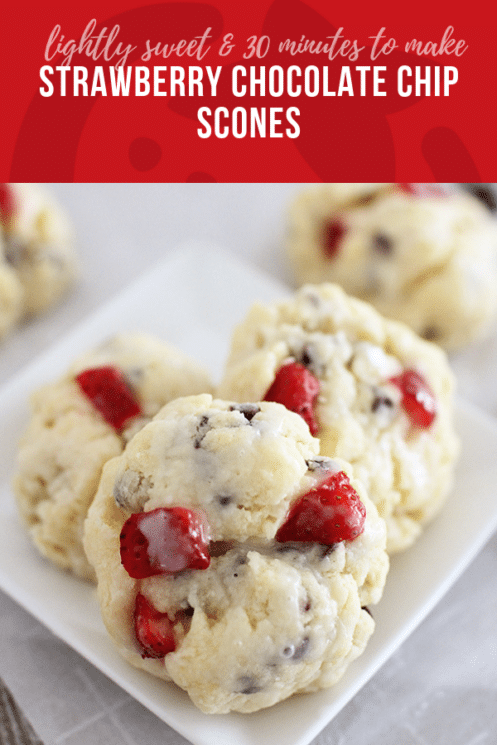 Just 30 minutes to make this lightly-sweet Strawberry Chocolate Chip Scone recipe, and win the heart of your littlest Valentines! 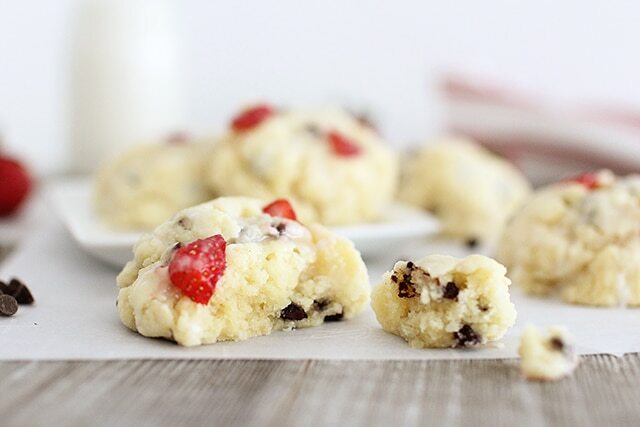 Scones walk a wonderful line between comforting sweet treat and elegant indulgence. And if you’ve only ever ordered one from a coffee shop, you’re missing out on the memorable experience of biting into a freshly-baked scone! 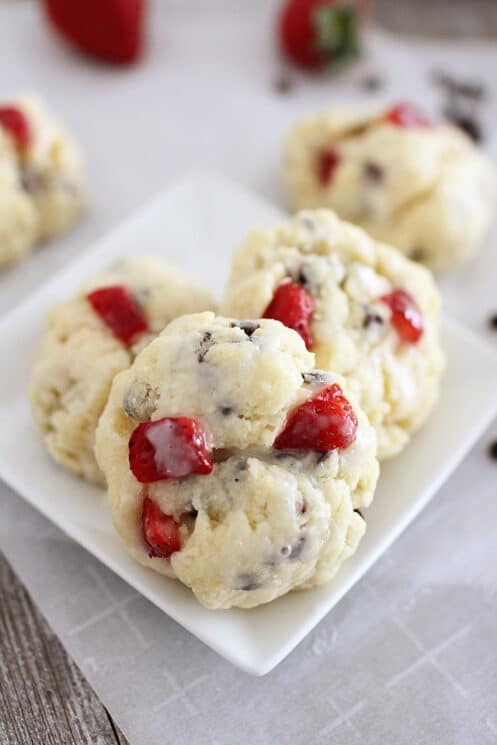 These light and delicious scones are studded with fresh strawberries and dark chocolate chips, then drizzled with a sweet glaze that locks in that perfect buttery goodness. As soon as you finish your first scone, you’re going to want a second one, then maybe a third. And your kids are going to have to polish up their negotiating skills, if they want to have a chance at the last scone in the batch. Brighten up your family’s weekend morning breakfast with these sweet, delicate homemade scones. Scones might seem complicated to make (after all, you’re used to seeing them behind glass in fancy little coffee shops.) But in truth, you’ll spend little more than 25 minutes turning out these sweet, chocolate-speckled creations. 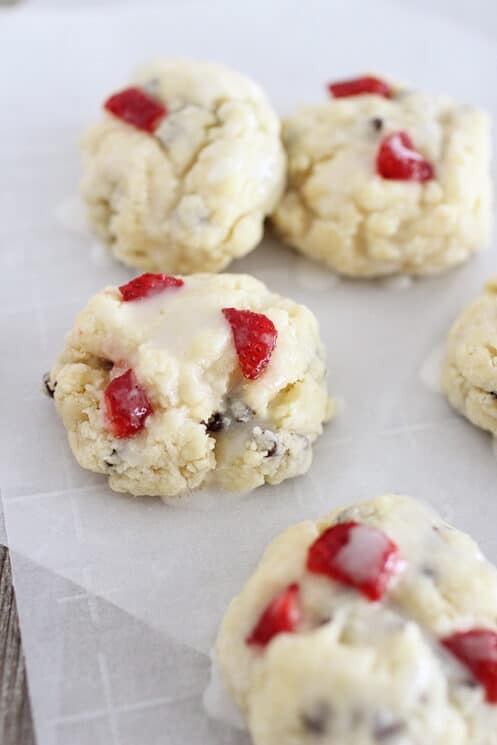 Basically, the technique for making these scones is not so different from making cookie batter, with one exception. You’ll need to start with very cold butter, and grate it (a cheese grater works perfectly) before adding it to the flour mixture. Keeping the butter intact helps perfect the buttery texture of your scones, so be careful not to over-mix. When you shape your scones, try to avoid handling the dough more than necessary. Less is more, here, which also happens to fit with the cooking MO of most of us busy parents! Allowing treats, and letting your kids see you enjoy them without guilt, helps kids develop a healthy attitude toward food. Including fresh fruits in sweet treats reinforces the lesson that fruits are super yummy, and they always belong. Offering sweet treats alongside other foods (for example, a scone with dinner) helps kids learn to enjoy fun foods while seeking balance. Making treats at home in your own kitchen teaches kids that treats can be special and made with love. So enjoy a homemade scone or two yourself, and tuck one into your kids’ lunchbox this week. Moms and dads, you’re still on track. For more chocolate-y indulgences, try Double Chocolate Banana Cake or Magic Chocolate Milk. In large bowl, mix together flour, sugar, baking powder, and salt. Grate or cut cold butter into smaller pieces. Using a pastry cutter, cut in the butter with the flour mixture until it resembles pea sized pieces. 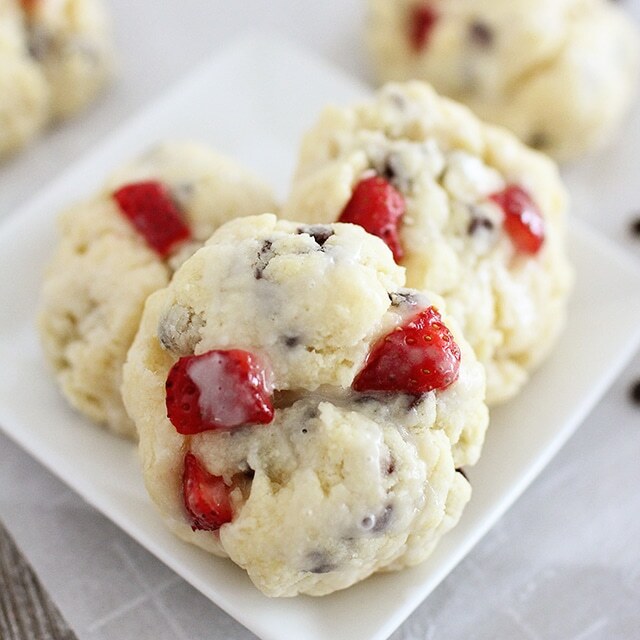 Gently fold in diced strawberries and chocolate chips. Pour in the cream and mix until just incorporated. Gently shape the scone dough into small round biscuits, and place onto the baking sheet lined with parchment paper. You can also press handfuls into a muffin tin if you prefer. Bake for 10-12 minutes or until light brown. Whisk together the powdered sugar, melted butter and milk. while the scones are baking. While hot, drizzle the icing on each scone. Let the scones rest and cool a few minutes before enjoying.